Some approaches to network programmability require control processes for network devices. Such control processes are executed at the device or at a control node locally connected to the device. This paper discusses the management of these control processes, which is part of configuration management. Typically, similar or identical control processes have to be installed on several devices of the same network in order to realize a desired service. In such cases an automated remote installation and maintenance of control processes is desirable, especially when devices are located far away from each other. 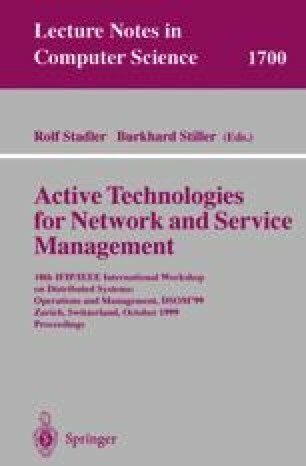 The idea presented and evaluated in this paper is managing the control processes remotely with the IETF SNMP ScriptMIB. It is shown that the Script MIB provides sufficient means for installing, configuring, starting, updating, replacing, and terminating control processes for programmable network devices. We applied our idea to GSMP control processes realizing an IP switching over ATM service. This case study demonstrates the feasibility, but also discusses practical problems and restrictions.